Two centuries ago, much of the world was left in the cold during what became known as the Year Without a Summer. Giving a historical event a name — especially a catchy name — has its drawbacks. A name can give an event too defined a shape, solidify it while making it smaller, like water beading on a surface. So it is with the name given to 1816 — the Year Without a Summer. The Blizzard, 1858, by Cornelius Krieghoff. 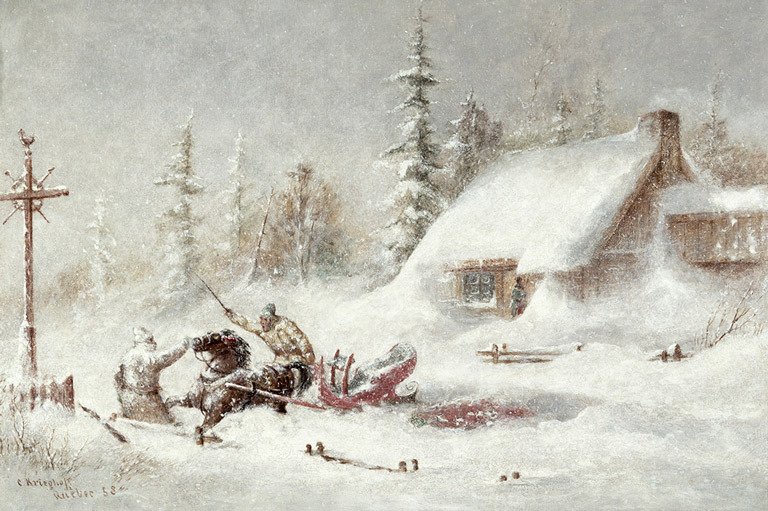 The artist's depiction of a harsh winter in Quebec could also have applied to the long winters of 1816 to 1818. The Year Without a Summer refers to what followed the global impact of a volcanic eruption on the Indonesian island of Sumbawa. When Mount Tambora erupted in the spring of 1815, it spewed about fifty cubic kilometres of rock, ash, and dust high into the air. Some of the particles remained suspended in the atmosphere for months, even years, effectively blocking some of the sun’s heat. What was by far the largest eruption in recorded history had the effect of cooling the planet’s surface. This led to widespread crop failures around the world. Hunger throughout Europe led to outbreaks of disease and food riots. Eastern North America also experienced intense bouts of cold weather in 1816, creating hardship for thousands of people. But the eruption’s impact was not restricted to one season, or even one year. Nor was the impact felt equally everywhere. Because eastern Canada did not receive the worst of this cold — and maybe because we expect Canada to be cold — the year has never been thought to be particularly momentous here. A 1986 article in the Bulletin of the American Meteorological Society calls the nickname “Year Without Summer” a “gross exaggeration” in reference to Canada. The newspapers, diaries, and government records of 1816 show that there was a summer that year, but they also show that British North Americans were affected greatly by wild weather patterns. What’s more, the focus on the conditions of 1816 has obscured the years that came before and after. Parts of Canada had already suffered several poor harvests in a row, so 1816’s bad weather threatened the colonies with extreme food shortages, making 1817 a year of deprivation for many. The winter of 1816 was not particularly cold in eastern Canada, but the spring made up for it. Snow remained on the ground, and more fell, long into May. In some places, livestock began to starve from want of grass. Only at the end of the month did the backward season begin to relent. The Quebec Gazette of June 6 noted that the late frosts did not seem to have done farmers much harm: “A few fine days, and the present rains, have restored the young crops to all their former vigor.” But immediately below this article, the newspaper reported, “Most Extraordinary Weather”: a foot of snow had fallen in the city that very day. Further west in what is now Manitoba, settlement was only just beginning. The Selkirk Settlers arrived in the Red River Valley in 1812. They too experienced a colder than usual summer in 1816. Peter Fidler of the Hudson’s Bay Company at Brandon wrote of a severe cold spell that began on June 5. “A very sharp frost at night … killed all the Barley, Wheat, Oats and garden stuff above the ground except lettuce and onions — the Oak leaves just coming out are as if they are singed by fire and dead.” The following summer was also relatively cold, with killer frosts in July. The cold summers on the prairies ended in 1818, but a drought that accompanied them persisted until 1819. In eastern Canada, the cold spell’s most profound, immediate impact was that the price of flour soared throughout the colonies. This was of great concern to a Canadian population that received about half of its calories from bread alone. With the exception of a cold snap in July, the weather for the rest of the year was actually quite seasonal. 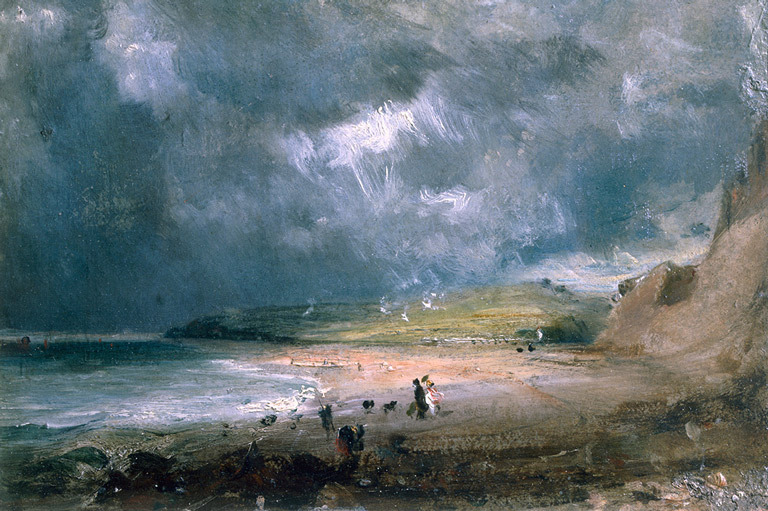 The cloudy skies of Weymouth Bay, 1816, by John Constable, suggest volcanic dust from the Tambora volcano. Reports from throughout the colonies agreed that, although it would be a bad year for hay and fruit in particular, the good quantity and/or quality of crops such as potatoes, peas, barley, oats, and, above all, wheat made up for it. The conditions held long enough that farmers in most places gathered an abundant harvest. But the late spring had meant late planting, and late planting a late harvest, so severe frost at the end of September and snow in early October devastated crops still in the field across Lower Canada (Quebec) and New Brunswick. The St. Lawrence Valley below Quebec City was particularly hard hit. Even those not yet experiencing hunger had every reason to anticipate it: The harvest was lost, food reserves were spent, and bread and fuel prices were high. Furthermore, poor labourers knew that there would be less work available in winter and that it typically paid a quarter to a half less than in summertime. Well before winter set in, the residents of the parishes outside Quebec called on the government for relief. Amid this chill, and on the heels of meagre harvests, the poor of all the colonies experienced varying measures of what was universally called “distress.” As many as three thousand people in the suburbs of Montreal, twenty per cent of the population, were reported to be without food or fuel. There was alarming scarcity among the unfortunate of Halifax, with the threat of “robbery or starvation” sure to follow. The entire population of Newfoundland suffered from lack of food, punishing weather, and being completely cut off from the rest of the world. Found in the ashes of a St. John’s fire were forty barrels of potatoes that the owner had been selling on the black market at outrageous prices. Colonial governments had foreseen the looming food crisis and did what they could to prevent and prepare for it. As early as October 1816, Prince Edward Island Lieutenant-Governor C.D. Smith banned the export of agricultural products from the Island. The other colonies soon followed suit — all but Upper Canada (Ontario), which had largely escaped the bad harvests and whose wheat would be needed to feed the other colonies. This was as much interference in the market as some legislators would tolerate. When Lower Canada’s council was told that the people of Kamouraska had eaten the last of their cattle and were on the verge of starvation, the Speaker argued that at most an interest-free loan should be granted, that the region was in fact sufficiently well-off to buy food of its own. Many believed that the poor should be made to work — one suggestion was to have them shovel snow into the streets to assist the sleighing. Yet it was generally understood that the most desperate were often in no position, physically or geographically, to travel for work and that, more to the point, wintertime unemployment and resultant deprivation had become an endemic part of Canadian society. In the crisis of the winter of 1817, governments focused on providing relief. Lower Canada, for example, distributed £15,000 (comparable to about $2 million today) worth of food and voted to lay out the same again. Newfoundland purchased more than 100,000 pounds of flour from the commissariat, the supply office for British forces in the colony. Relief also took the form of seed grain — Lower Canada set aside a loan fund for farmers purchasing seed. Yet not all locales fared equally well. Parts of Upper Canada, having missed the worst of the 1816 weather, lost crops to rust disease and frost in the fall of 1817. St. John’s, Newfoundland, still suffering, was hit first by fire that fall and then by the coldest winter on record. Tambora’s severe effect on British North America’s weather only began to dissipate in 1818. The post-Tambora period could be more accurately called “the years without,” or, better still, “the years without, for some.” Of course, at some point, a too-inclusive name loses not just catchiness but meaning. Pulling apart the perceived simplicity of this moment in climate history can be a valuable reminder that climate has never been singular; it has never meant a single weather experienced in all places by all people. And, as in the past, so in the future: “Climate change” (let alone “global warming”) is far too simple a term for what we have to look forward to. Alan MacEachern's article appeared in the August-September 2016 issue of Canada's History magazine. To view source material, such as newspaper articles, used for this article, see this link on the Network in Canadian History and Environment (NiCHE) website. In the late-1800s, few Canadians cared whether crops would grow on the southern prairies. Most believed it was a barren wasteland. But then a drive to settle the Last Best West changed everything. Grey Owl’s admirers thought he was too good to be true — and they were right.